For centuries they have lain forgotten and untouched in the murky depths of the Mediterranean. But the sunken glories of Greece are now threatened by modern treasure hunters, who are targeting their riches since the lifting of a ban on coastal scuba-diving. At risk, say archaeologists, is an unseen part of the country's cultural patrimony, comprising thousands of shipwrecks dating from Classical, Hellenic, Roman, Byzantine and early modern times and their priceless cargoes of coins, ingots, weapons and gold. 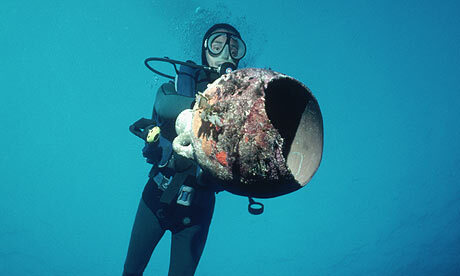 "Greek waters are some of the richest in antiquities in the world," said the marine archaeologist Katerina Dellaporta. "Thanks to very stringent controls over underwater exploration shipwrecks have been extremely well preserved." Until recently divers were allowed access to just 620 miles of the country's 12,000 mile coastline, but in an attempt to boost tourism, the conservative government opened the country's entire coastal waters to underwater exploration in 2003. Since then, looting has proliferated, say archaeologists. Treasure hunters, encouraged by scuba-diving websites from America to Australia, are homing in on the "archaeological sea parks" armed with hi-tech scanners, cameras and nets.